Kihei Bay Surf #257 Remodeled 2nd Flr Studio, Part. Ocean View, Great Rates! 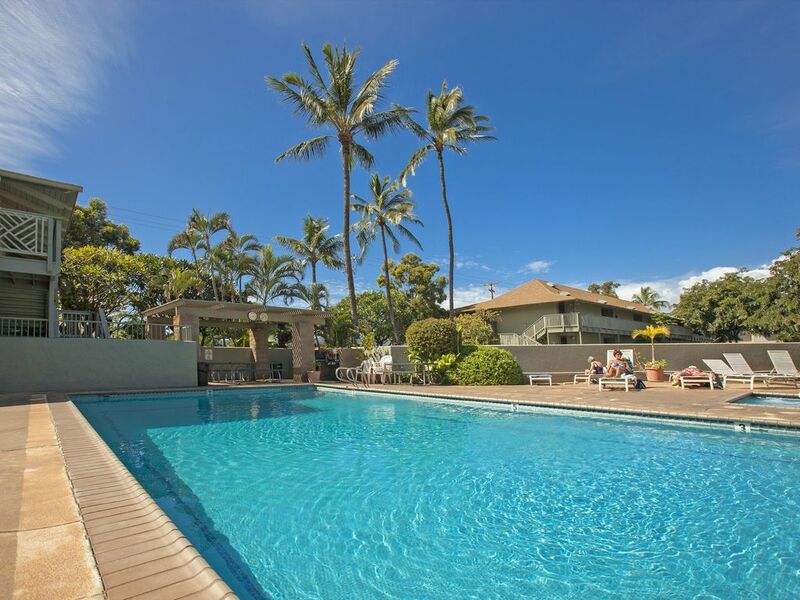 The Kihei Bay Surf is located in North Kihei across the street from the Whale Sanctuary and Kalepolepo Beach Kihei Bay Surf has a large pool, hot tub, tennis court, gas grills, and a coin-operated common laundry area. Whale watch, windsurf, walk the beach, and enjoy the most amazing sunsets imaginable. The Kihei Bay Surf is centrally located to shops and restaurants, and is just minutes from the championship golf courses of Wailea and Makena. This is one of the best values in Kihei.. Each studio has a fully equipped kitchen and cable TV. In addition, there is a large pool, hot tub, tennis court, gas grills, and common laundry areas for your use. The property was clean and looked very nice. My family and I very much enjoyed staying here. The couch was replaced by a different one in the picture. We were able to pull it out into a full bed, which was really nice! We had some issues working the tv but ended up getting the hang of it. You have to click power before any other action - power, tv - power, change channel. Then it worked fine, there should definitely be some instructions. We never really spoke with any property manager during our stay, only when she was there on the dot at 11 to make sure we were leaving. However the area was beautiful, very close to food and shops and the beach! This is the place to go! The shower was very nice as well. We had an awesome trip. overall enjoyed our stay at the kihei surf and condo # 257 was pretty much what we expected with no unpleasant surprises. the condo does have a partial ocean view which we enjoyed but comes at the price of major road noise.the noise does not effect the interior of the condo but was a major factor on the deck.we found the bed a little soft for our liking and the sheets a little worn,but other then that were overall happy with our decision.the one issue we had was quickly cleared up by rentals maui. the kihei bay surf is very well maintained,although getting a little old.we however found the location inconvenient as it is a couple of miles out of the heart of kihei and nothing was even within walking distance.we felt we received our moneys worth but would probably look for something closer to downtown next time.the park and beach across the street were a definite bonus. This is a beautiful little spot with beach access right across the street. There's also a free museum beside the beach as well. The property was well maintained and clean. I would stay here again. It was a great trip. We could hear the wave. Place was clean, only thing missing was laundry soap and one snorkel and mask. Overall everything was nice in this condo. Very clean love waking up to the sound of the ocean. The only thing was it was missing one of the snorkeling masks to go with the swim fins we ended up having to rent one. Also there was no laundry detergent and upon checking the paperwork on the door that has all the towels and linen it hasn't been restart or even checked off since 2013. Also the laundry room only had four of the eight Dryer's working. And there was also water all over the floor leaking from somewhere and one of the people that actually live there said the complex was trying to figure out where it was coming from. Other than that it was a very nice day and I would stay here again.